Try saying that really fast, I dare you. I thought it was a bit of a con on behalf of Selley’s. 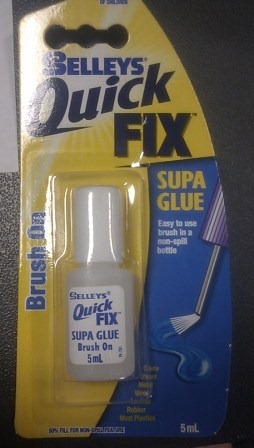 Sell a half full bottle of “Super Glue”, and call it a feature. But it works extremely well. Being able to brush the super glue stops the things I’m joining, from ending up like a water soaked girl. Which incidentally, looks like this. Downsides? None that I can think of. ← “What’s wrong with the door?”, asked our Facilities Lady.